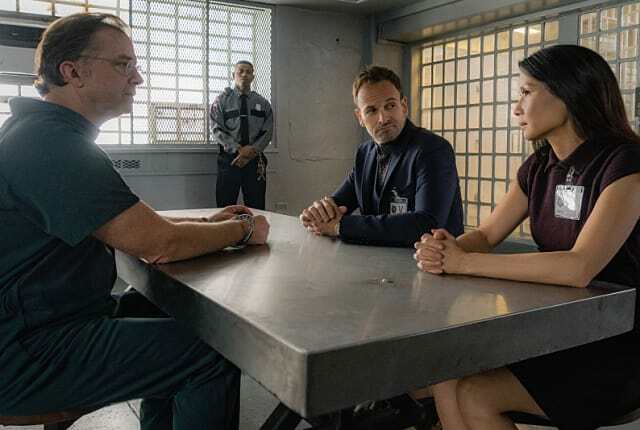 When you watch Elementary Season 4 Episode 8 online, Sherlock and Joan assist the NYPD in investigating the murder of a young woman killed in a fashion that resembled the murders by a notorious -- and incarcerated -- serial killer. They immediately suspect that there is a connection there, perhaps with one of the family members of the original victims. Why kill this woman, however? The situation is complicated when other facts come to light, including that she was apparently pregnant despite a tubal ligation and that the aforementioned incarcerated serial killer was her father. It's down to our intrepid consulting detectives to hunt down the truth and uncover what really happened to spur this murder and why. At the same time, Sherlock is surprised when he comes home to find Detective Bell at the brownstone with Joan. While he suspects at first that they are sleeping together, it turns out the truth is far more innocuous: Joan is helping him study for the examination for sergeant. Sherlock, naturally, takes it upon himself to assist, as well, much to Bell's chagrin. Will the team figure out what really happened to Ella Jacobs? And what will happen with Bell and the sergeant's exam? Find out by watching Elementary Season 4 Episode 8 online! Marcus was here, I took a shower, so obviously we're secret lovers. Permalink: Marcus was here, I took a shower, so obviously we're secret lovers. Do I sit on the bride's side or the groom's? Permalink: Do I sit on the bride's side or the groom's?